Nestled on the side of Lookout Mountain. Relax on the many decks and watch the world go by. Front porch life So many decks to choose from Chill on your own or gather with friends and family. Solid wood door into the beautiful entryway. The view from the front door. The kitchen is absolutely beautiful. The open kitchen makes for great meal times. Great for dinners in. The open living and dining area. Relax by the fireplace in this remodeled mountain cabin. The master bedroom has a view out to the deck and forest. This beautiful master bath has heated floors. The master bath. This bedroom on the main floor also has a full bathroom. This full bath is adjacent to the twin bedroom. The downstairs bedroom has a queen bed, a full bath is on the same level. The downstairs, queen bedroom. The downstairs, queen bedroom. Another view of the downstairs, queen bedroom. This full bath is on the lower level of the home. There is a full laundry room on the lower level. The folding table in the laundry room. 3 miles from Rock City. Beautiful home with an artist's touch. Numerous decks fo find your own personal nook. On Lookout Mountain by Ruby Falls, minutes from downtown Chattanooga. Open kitchen, fireplace, master suite on the main floor. Private second queen bedroom on the lower floor. Want to live like a local, steep driveway and all? This mountain side cabin has two levels with three bedrooms each with its own full bath, and one separate half bath. The open kitchen and keeping room area makes for lovely mealtimes. The living room/dining combination allows an eastern mountain view at dinner out the back windows. You can enjoy the winter vistas looking northeast over the City of Chattanooga from one of two decks surrounding the back of the cabin. The Nest has several outdoor areas for coffee in the morning. The Master bedroom has a queen sized bed with a view overlooking the outside deck and the forest beyond. Enjoy the heated floors in the master bathroom, the tiled shower, and gracious bathtub. There is basic cable at the property, but this suite also has its own personal mini-split heat and air conditioning unit just for that bedroom and bathroom so you can dial in your own comfort ! The second bedroom on the main level has two comfortable, grown up twin beds and a full bath with shower. Located off the main entry door, this bedroom is perfect for guests wanting in on the action. On the lower level are the full-sized washer and dryer, plus a bedroom suite with a queen bed, and full bath with shower and a separate water closet for more privacy. This suite has exterior doors so you can walk out onto the deck for quiet yoga or reflection before breakfast or at the end of your day. Maximum occupancy at all times is 6 people. Only a mile to Ruby Falls, 2.6 miles to Rock City, and 6.2 miles to the Tennessee Aquarium makes this a great choice for visiting all the area attractions. The bedrooms are separated for privacy and the lower level has a full washer and dryer for convenience. Close enough to great restaurants downtown and in St. Elmo or choose to cook for yourselves in the gracious kitchen. Absolutely one of the nicest properties I have stayed at. Highly recommended! Only had one question prior to arrival that was answered immediately. Thoroughly enjoyed our family stay at the Nest! Warm, cozy, clean. Very comfortable. Due to navigating the steep driveway, would suggest arriving during the daylight the first time; otherwise, no problem. Great place! Our overall stay was exceptional. It is a great location, Beautiful decorating( like a Hallmark Movie). However, our only complaint is the tv channels do no include ESPN and with a family of sports nuts and traveling holiday weekends when we were staying in just hanging around to find out you didn't have was a great inconvenience. It did have a Smart TV and we did connect with our home service but the connection was not at all great , it kept freezing up and staying fuzzy:( Please upgrade your TV package as we would Love to stay here in the future:) thank you so much for sharing your property! Quite helpful and very timely. Couldn't have asked for better customer service. Cabin was just right for 6 adults. The outdoor firepit was a major plus. Appliances where updated and the cabin came with internet and plenty of room to spread out if the weather outdoors was bad. Only problem we had was getting the door to lock back. But we realize it was probably user error. A sign up somewhere with the house name would help too. We went to the front door first (which was open by the way) and we saw the TV on and heard the music. So we assumed we at the wrong place. A name at the door would have been helpful. Driveway is a booger! And we live in the TN mountains. Winter just wouldnt be pleasant getting in and out. Everyone I spoke to was friendly and professional and offered lots of information about fun activities near the rental. It's always a little scary to pay upfront for lodging you've seen only on the internet, but you can trust Chattanooga Vacation Rentals - they're doing a great job! The Nest is such a fun place to stay - it is unique with extensive porches and lots of places to take in the fresh air and views. The house is clean and comfortable and well-equipped. We loved it! Excellent! What a great place to be! Beautiful view, great location and a home with a ton of character. Very clean and plenty of room. Within a few minutes of most everything you want to do in Chattanooga. We had a great time with great friends! Thanks again! --Thank you for coming to stay with us. Come back anytime and stay a little longer! Great Space inside and out... a place where you can relax. Cozy up to a fire inside or surround a barn fire. Sit and enjoy the daytime scenery or wallow in the twinkling lights of Chattanooga down below at night. You can't go wrong at the Nest. ---Thank you for staying with us for a Long Visit Come back anytime we enjoyed having you! Wonderful Stay! We stayed at the Nest for four night over the week of Christmas. The cottage was decorated for the holidays and very clean! We enjoyed the decor and the fabulous decks the property offers. The Nest was well stocked for a large family to be able to function for a several night stay. We hope to visit again in the near future! *Thanksgiving in Chattanooga Excellent time spent with family to enjoy Thanksgiving. Great location to downtown Chattanooga and close to many hiking trails. Had a relaxing time with family. Love the fireplace. ***CVR: Thank you for coming to stay at the Nest. We are pleased that you enjoyed your time in our area. Come back soon and stay a little longer! Beautiful home on Look out Mountain. 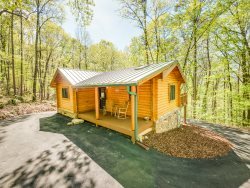 This cabin/home is perfect to experience both being on the mountain and seeing the sights of Chattanooga. You can not beat the location. The home is cozy, with nice furnishings, original art, remodeled bathrooms and conveniences of home. It has a view of the city lights and very lush surroundings with tall trees. The kitchen had everything needed to cook a meal for 3. The home has several decks to enjoy morning coffee and a fire pit for smores. This property is a great value too. We would rent this again next visit. The Nest in Chattanooga The Nest is my favorite VRBO ever! The location is perfect. When we arrived, the TV's were on a soft music station with scenery slide shows playing, lamps were on all over the place giving it the most wonderful, comfy feeling. The bird theme in the house was so cute. Everything is upgraded from kitchen to baths and the bedrooms have quilts and pillows and all things comfortable. I LOVED IT!!!! Such a wonderful place. Upon entering the home we were greeted with peaceful music. How relaxing after a long drive. The home was very clean and ready for our stay with another couple. It was very comfortable and spacious. Appreciated the quietness, and closeness to Ruby Falls, Rock City, the Incline Railway and the Aquarium. The home was well supplied with kitchen equipment, paper products, bathroom towels, and soap. Really liked how antiques and modern furniture were incorporated. It was interesting especially the hand painted furniture. Enjoyed the painted pictures by Lydia (?). We would stay again. The only thing we would suggest is coasters for the living room. We used paper towels or napkins so as not to harm the tables in any way. The Nest is the best. Beautiful location for our Family Vacation. Home was comfortable and homey. This home is wonderful. Great location and very peaceful. Well maintained and very clean. Had a delightful 3 days here as hostess for my 4 roommates from college. We were thrilled to be together after 34+ years, and enjoyed the magazine worthy decor, the comfy beds, plenty of hot water, and outdoor seating on the pretty decks. Great eats available for dinner at Canyon Grill (make a reservation a couple days ahead), Cafe on the Corner at the top of the mountain, quick and economical pizza at Mr. T's at the foot of the mountain (across from the Incline). Quick trip up and down the mountain, so handy to everything downtown. This one is a gem! The rental property was wonderful. It is on Lookout Mountain. The view driving up and down the mountain is fantastic. The place itself is very roomy and clean as well as beautifully decorated! It is very close to the Mountain attractions as well as downtown Chattanooga and all the attractions there. I would highly recommend this place to anyone! What a gorgeous place. The view is awesome. The house has so much charm and is all redone. It is only about 15 mins from Downtown Chattanooga too, which was a plus. The only downside, which i think you would have with any rental, is that they were pretty strict about the 6 people max. We wanted to have friends over and have a fire at the outside fire-pit, but we didn't want to upset the neighbors. Which i can totally understand! Other than that, Great place and would definitely stay there again.